ROYAL Welsh deja vu permeated the commercial classes at the 2011 National Limousin Show as two Llanelwedd winners battled for the main silverware. Jager Bomb, a 13-month Limousin x steer from Tecwyn Jones, renewed his rivalry with Minnie M, 14-month-old Limousin x heifer from Nantglyn’s Glyn Howatson. In the event both had to give way to the female leader, Mysticque, shown by 18-year-old Jennifer Hyslop. The 427kg heifer, from Scotland’s Hyslop & Richardson, was crowned overall champion at the Carlisle show. Jager Bomb, last month’s Royal Welsh commercial champion, took the reserve supreme title, while Mini M had the consolation of winning the home-bred title ahead of another Tecwyn Jones entry, Black Beauty. The latter went on to claim the pairs title with Jager Bomb to cement a profitable outing for their Llanrwst owner. Jager Bomb, weighing 574kg and bred by MW Jones, was bought at Ruthin in February. Separating the top animals proved a difficult job for judge Alistair Graham, who also had words of praise for home-bred 432kg Minnie M.
Standing reserve to Jager Bomb in the steer competition was 566kg, 15-month-old Oh Boy, bred by Messrs Powell and fielded by TC Edwards & Sons, Pen-Y-Bryniau, Betws GG. And a red rosette was claimed by Pampers, the heavyweight heifer leader from H Roberts, Mathafarn Bach, Bodffordd, Anglesey. 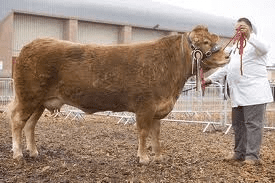 Overall pedigree champion was the two-year- old heifer Trueman Euphonium, bred and exhibited by the Savage family from N Ireland. The National Limousin Show was the centrepiece of weekend celebrations to mark the breed society’s 40th anniversary in the UK. Almost 3,000 visitors attended an open day at Wigton, Cumbria, where Messrs Ridley run the top-rated Haltcliffe herd.